In the southwestern part of Slovenia and surrounded by the beautiful wooded hills, rises the Rihemberk castle, also known as Grand Branik. Rihemberk is a superbly preserved medieval castle, which over looks the village Branik located near the Slovenian town of Nova Gorica. The first time the castle itself was mentioned in the late 12th century as a fief of the family Rihemberk. Most likely, the palace was erected earlier in the 12th century to control the commercial crossroads in the region. There are the important routes that pass through Karst towards Trieste and the Friuli Plain. It is assumed that the first lord of the Rihemberk castle was Patriarch of Aquileia. They inhabit their stronghold until the 1371 when it passed into the hands of the Counts of Gorizia. By the year 1500 the last of the Counts died. 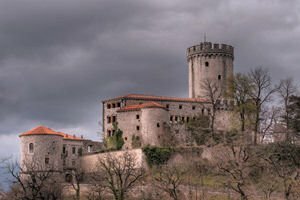 Rihemberk castle becomes the property of Maximilian I, who heads the Habsburg Empire. In 1528 King Ferdinand I was given the right of use over the Counts Lantieri. They brought significant improvements in the construction of the castle until the mid 17th century. During the Renaissance era beyond the protective walls of the Rihemberk castle, residential buildings were added and along with that a shaped patio. The Lantieri family retains ownership over the palace until the end of World War II when their belongings and the entire castle was seized and Rihemberk came apart of the Yugoslav Communist Party. In the 40 years of the last century the palace was in a terrible state because it was badly damaged by the Serb guerrillas. Other sources indicate that the reason for the deterioration of the medieval fortress was because the Germans used it to store ammunition. Rihemberk castle is remarkable for its high oval cupola. In one of the other towers today lives a colony of bats. Many people define Rihemberk as a fortress of a Mediterranean type. Today the interior of the palace is not open for public visits, although in recent decades it has been constantly renewed.